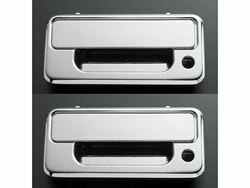 It’s time to lose the unsightly plastic door handle that come factory with your truck, and replace it with our solid billet assembly. These heavy duty brutes are not the imitation stick on overlays, these handles add security and style to your vehicle. Crafted here in the USA. Available finish options: polished chrome or brushed chrome.